Young creatives are given precedence in 2018's Annual. The launch of the D&AD Annual is always an exciting event. Creatives get to discover who designed the prestigious book and how they have put their spin on the annual, and also see all the winners of the year's D&AD Awards collected in one beautiful volume. The annual is always a masterclass in how to design a book, but at last night's launch party D&AD revealed that its 56th Annual contains something extra special. This year's Annual was designed to not only celebrate Pencil-worthy work from across design and advertising, but also create something that would stimulate and inspire young creative talent. Who designed 2018's D&AD Annual? Step in Magpie Studio, who designed this year's Annual. Known for its playful spirit, award-winning London agency Magpie Studio experimented with the format of the Annual, and cut the front cover in half to make space for a new addition: the Manual. 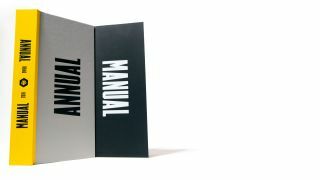 The Manual is detachable from the main Annual, and is aimed at young designers and creatives who are just entering the industry. It features creative tasks, such as reimagining a doughnut or cutting out and rearranging a series of flags, as well as nuggets of inspiration and wisdom from industry heavyweights such as Michael Johnson (Johnson Banks), Bjorn Stahl (INGO Stockholm) and Alice Tonge (4creative). The Manual describes itself as a "guide for the dreamers and the idea-havers", and the front page encourages Annual owners to detach their Manual and pass it on to "someone with big ideas". It uses the same typeface as the Annual, Timmons NY, in order to give the titling impact in a modern and utilitarian way. "There have been so many beautiful and interesting Annual designs over the years that I thought this year we use the book to give a bit more back to people just starting out," explains outgoing D&AD President Steve Vranakis. The Annual is available to buy now from D&AD.